How does CouchDB handle authentication? It doesn’t have openid support on its own does it? So, you know what would be fun… getting the Tomboy/Snowy developers to take a good hard look at CouchDB. Do they feel like it solves their sync scenario adequately? Are you going to be going to GUADEC to talk about CouchDB? Make sure to test with syncing large files (300 MB +). I would hate to see something break because it tried to put a 1 GB json object into a string (think iso files), and ran out of ram. Isn’t this what conduit is for?? Seems like a conduit provider for ubuntuone could do this and more? Don’t forget installed apps. Take apt’s list of installed applications and optionally add or remove them from different machines. ..because that’s the only thing Windows and OS X can’t do with such a service, because it requires a package manager and software repositories. This seems interesting, but how would it fit in with apps that use sqlite databases? Would they be forced to switch to CouchDB? I am interested by CouchDB for a few projects, but I am wondering about the footprint. 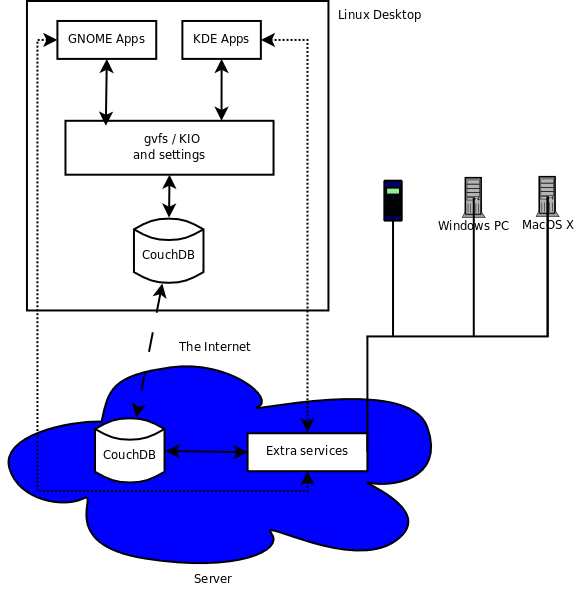 From what I understand you need to run a CouchDB server on your machine (no embedded version) and communicate with it via an HTTP interface. This does not sound very lightweight. Have you made any measurement on this? Would this also be a good use for Midgard2? I know that there is somebody trying to port tomboy to midgard to do just what you are talking about. I don’t think you’ll be able to use CouchDB out of the box to maintain a revision history. See, http://wiki.apache.org/couchdb/Compaction and https://issues.apache.org/jira/browse/COUCHDB-36. This one could be used for local install of couchdb.